Persona Q2: New Cinema Labyrinth is already available in Japan, and today Atlus announced that fans in the west will be able to play the game this summer. Pictured above is the “Showtime” premium edition of the game – it includes a 5″ plushie, deck of cads, art book, buttons and an outer sleeve to keep it all in. 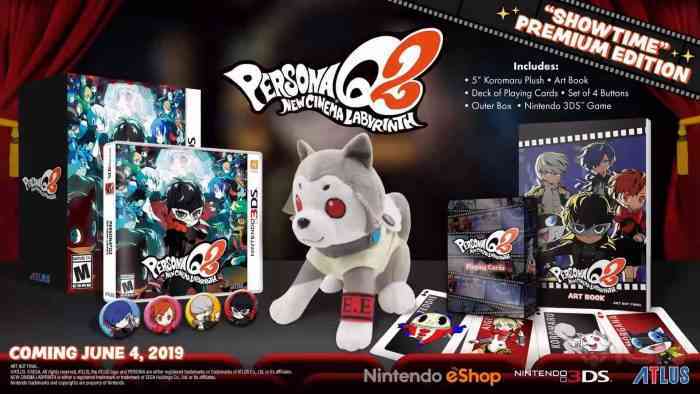 The standard edition of the game will also include the four buttons, which feature the protagonists of Persona 3, Persona 3 Portable, Persona 4 and Persona 5. The opening cinematic has also been shared, check it out! Persona Q2: New Cinema Labyrinth is being noted for the reintroduction of the Persona 3 Portable female protagonist and it’s unique dungeon designs. It’ll launch exclusively on 3DS on June 4th, 2019.